Who’s Fingerprints On ‘Hand Of Frog’? The Daily Star has been dabbling with ‘Le Hand That Rocked The World’, The Times went with a rather clumsy ‘Hand of Gaul’ on Friday’s front page, but there was only ever really one Thierry Henry / plucky Irish heartbreak headline that was going to catch the mood. Hand of Frog was the clear winner …er, hands down. 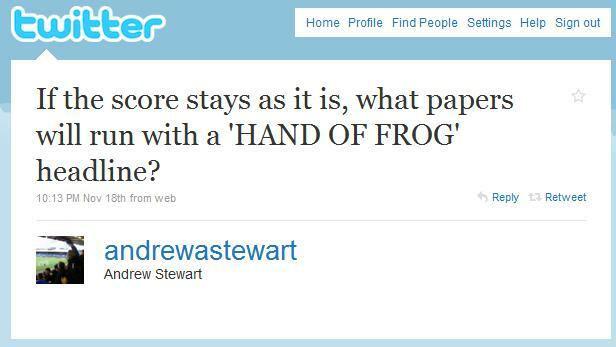 Posted on November 21, 2009 November 21, 2009 Categories UncategorizedLeave a comment on Who’s Fingerprints On ‘Hand Of Frog’? An unexpected level of openness in today’s readers’ editor column in the Observer. Stephen Pritchard is the readers’ editor in question and he writes about the crippling fall in advertising to have afflicted Guardian News & Media: revenues down £33m in six months. In times past it fell to others to write gleefully about their rival’s distress, while the newspaper in question would be in silent denial. These are painful times here. Not so long ago, the Observer looked threatened with closure as losses across both titles reached a frightening £100,000 a day. Mercifully, that threat has receded, but the price of survival is a high one. Three of the four monthly magazines – Observer Woman, Observer Sport Monthly and Observer Music Monthly – must close, leaving only Observer Food Monthly still being published. Whatever your opinion of them (and they were always controversial), these monthly magazines gave the Observer a distinction that marked it out from the other Sundays. The loss of their crackling creativity will undoubtedly affect circulation, but they were cripplingly expensive to produce; major surgery was necessary if the heart of the Observer was to keep beating. No mention of the 100 or so job losses but, to be fair, mediaguardian.co.uk has been running that story since Wednesday. For a newspaper that prides itself in being attuned to its readers’ sentiments, it is odd to see The Sun so out of step on the Jamie Janes affair. Odd but not unique. Prime minister Gordon Brown may not be wildly popular across the country but many feel he is victim of a smear. As the BBC’s Nick Robinson noted on his blog and on the Ten O’Clock News last night, it’s “clear from the phone-ins, the text messages, the blogs and the like that many share that sympathy [with Brown]”. And that includes those who have passed judgement on The Sun’s website itself. jessicauk: [sic] fell sorry for the pm, seems nothing he does nowadays is right. Jamie-101: Yes, the view that the note contains 25 spelling mistakes is clearly that of an illiterate who does not generally write by hand. Quite odd and disgusting to reduce the conflicts and the loss of life to this utterly puerile level. Brown is wrong on many things; he is honourable in writing thus. The last time I can recall a national newspaper being so out of step with its readership (or should that be its commentariat?) was when the Daily Mail published an interview with former Guantanamo Bay detainee, Binyam Mohamed. Ship him back to Ethiopia and stop using my taxes to house and feed him! This man is NOT BRITISH, illegally entered the country, went to Pakistan (for help in beating his drug habit – yeah, right!) so, to be blunt – WHO CARES. You put yourself in the Terrorist arena mate so you take the consequences of your action. The backlash, far more predictable perhaps, has echoes of the more recent case. But where the Daily Mail may have expected a negative reaction, The Sun is left slightly stunned. – The Sun’s sympathy for a grieving mother… or simple exploitation? – Daily Mail Ends Moderation. Will Anybody Notice? Writing in The Times today, columnist Matthew Parris offers a welcome alternative to the tiresome ‘They Still Don’t Get It’ line on MPs’ expenses. And he sheds an interesting light on the bills of newspaper folk at the same time. I last week submitted to this newspaper my expenses claims for the three annual party conferences. For nearly a month I got to stay in three expensive hotels, with restaurant and bar bills all reimbursable by my employers — reimbursements being allowable free of income tax on the ground that the costs were incurred “solely and necessarily in the performance of [my] duties”. Has new media reinvigorated democracy or throttled good journalism, asks Dr Natalie Fenton in her forthcoming book ‘New Media, Old News: Journalism and Democracy in a Digital Age’. And her answer? Well, the clue is in the title. Fenton and her team of researchers at Goldsmiths make two key observations. Firstly, that the mechanics of the journalist’s trade is suffering because of the desk-bound demands of new media – ‘iron cages’, they call them. Secondly, new media rarely means new voices on the national stage because the ‘economics of news remains stacked against the newcomer’.